Will your taxes increase or won’t they? As EAI has written on previously, there aren’t any mainstream proposals from the Governor or Legislature that would ensure Vermonters healthy tax rates for years to come. But if we are discussing only 2019, Governor Scott’s proposal is more affordable. By using Game Theory, we can predict that any compromise will fall in line more with what Governor Phil Scott wants and less with what Democratic Leadership has proposed, helping Vermont avoid a government shutdown. Scott has the self-interest and the leverage to stand firm for stable taxes. What is game theory? Game theory is a tool used to analyze rational choice by taking into account the choices an individual expects others to make. In life, when we make decisions that involve other “players,” we cannot take into consideration every relevant detail, so we must identify the most pertinent details and omit the others. First, we assume that the individuals “players” in the game are not looking to take other players down a peg. Second, we assume each player is seeking the best outcomes for themselves and are indifferent to the outcomes of others. Third, all players have complete knowledge of the situation. If there are 4 “Outcomes,” each player understands exactly what they are, and what the other players would gain from each. Finally, since turn-based games add complexity, it is easiest to demonstrate the usefulness of game theory with a simultaneous game. Both Scott and Legislative Leadership only see the choice the other has made after their own choice has been made. Scott (represented in Blue) has made his position known: he wants “Stable Taxes,” and has promised to veto any legislative proposal to “Raise Taxes.” Therefore, in this model of the game, the Stable Taxes option will be Scott’s “Stay” choice, while his potential to “Raise Taxes” will be his “Concede” choice. Senate President Tim Ashe and Speaker of the House Mitzi Johnson represent Legislative Leadership and the Democratic majority in Vermont’s legislature. They recently maneuvered a property tax hike against Scott’s wishes. Therefore, Leadership’s (represented in Green) “Raise Taxes” will be Leadership’s “Stay” choice, while Leadership’s “Stable Taxes” will be their “Concede” choice. As we construct our “Matrix” in “Step 1,” giving us 4 “Outcomes.” Off the bat, we know that if both players “Stay” (4th Outcome), we will get a Government Shutdown (Red). Now, on to assigning “Payoffs” for each outcome. 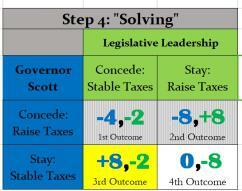 For each of the 4 outcomes, there are 2 “Payoffs,” 1 for Scott (a blue #) and 1 for Leadership (a green #). Payoffs represent the Vermont voters who will vote for/against legislative Democrats or for/against Scott. 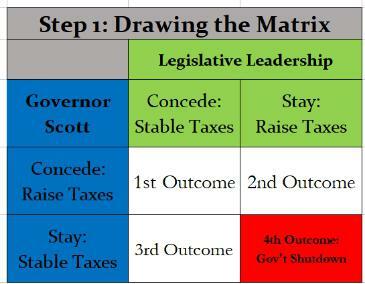 For Governor Scott (“Step 2” diagram), the 1st and 2nd Outcomes where he “Concedes” will have a lower payoff than the 3rd and 4th outcomes, where he “Stays” for stable taxes. In the real world, a “stay” move means a veto of a tax increase. The 1st outcome in which Scott and Leadership both “Concede” would be slightly better than the 2nd Outcome where only Scott concedes and gets nothing in return. Therefore, we will give Scott a negative payoff for the 1st and 2nd Outcomes (“-6” and “-8” payoffs) because he would have failed to deliver on his campaign promise to stop rising taxes. 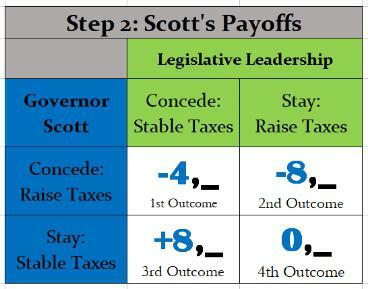 The 3rd outcome where Scott “Stays” for Stable Taxes and the Legislature Concedes is Scott’s best possible Outcome. Though, the 4th Outcome, in which both Leadership and Scott “Stay,” resulting in a government shutdown, isn’t all that much worse for him. Scott can ‘spin’ a shutdown and tell Vermont voters that their Leadership didn’t want to stabilize their property taxes. While voters might not be happy about a shutdown, they are more likely to blame Leadership than Scott. 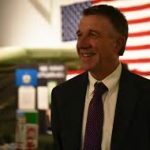 Therefore, the 4th Outcome has a “0” payoff for Scott, indicating he didn’t significantly increase or decrease his chances of getting elected governor again. The 3rd Outcome, in which Scott’s promise of “Stable Taxes” triumphs over Leadership’s plan for Raising Taxes, gives him a “+8” payoff. On to Legislative Leadership’s payoffs (“Step 3” diagram). We assume that Ashe and Johnson are not able to get the legislative votes required to override a Scott veto because there are enough Republicans in the House to block a veto override. The 1st and 3rd Outcomes in which Leadership concedes to Scott’s plan for “Stable Taxes” will have lower payoffs than the 2nd Outcome where they “Stay” for Raisi ng Taxes. The 2nd Outcome is the only one in which Leadership has a positive payoff. 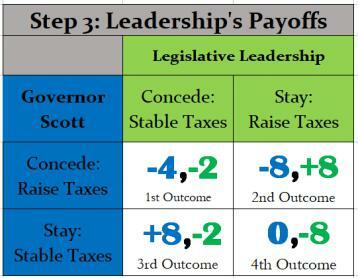 If Leadership can “Stay” for higher taxes and Scott concedes, this is the best possible scenario for Leadership, giving them a payoff of “+8” for the 2nd Outcome, and proving that Scott must bend to their will. Finally, “Step 4.” While voters might be willing to give Scott the benefit of the doubt in a government shutdown because Scott was standing for lower taxes, they would probably not do so for a Legislative Leadership that wanted to pay down the pension fund, a scenario that would do nothing for stabilizing taxes in the short term. For this reason, conceding to Scott’s plan for higher taxes (3rd Outcome, payoff= -2), gives Leadership a ‘less-negative’ payoff than “staying” than for a tax increase and a government shutdown (4th outcome, payoff= -8). If Scott makes Democrats accept “Stable Taxes,” the blame can be diluted across the legislature and have little effect on the election in November. Regardless of what Leadership chooses, Scott will always choose to “Stay” for “Stable Taxes, meaning Leadership will never to able to pick from the 1st or 2nd Outcomes. These outcomes are ‘greyed’ out in “Step 4”. Leadership must choose either the 3rd or 4th outcomes. In order to avoid a government shutdown (4th outcome, payoff=-8), a rational Leadership will choose the 3rd Outcome, with a payoff of -2. This makes it the Leadership’s best interest to choose the best political outcomes for Scott, the 3rd outcome, giving Scott a +8 payoff and Leadership a -2 payoff. In game theory, Scott’s self-interest to make the same move every time regardless of what the other player does is called a “Dominant Strategy.” While having a Dominant Strategy may sometimes mean choosing from two bad alternatives, Scott’s dominant strategy gives him the clear advantage here. You may have been able to guess the outcome of this game without using this process. But what happens when you add in hundreds of players in dozens of interdependent “games” going on simultaneously in Montpelier? Mastering game theory can reduce your tax uncertainty by helping you to predict the outcomes of political games like this.